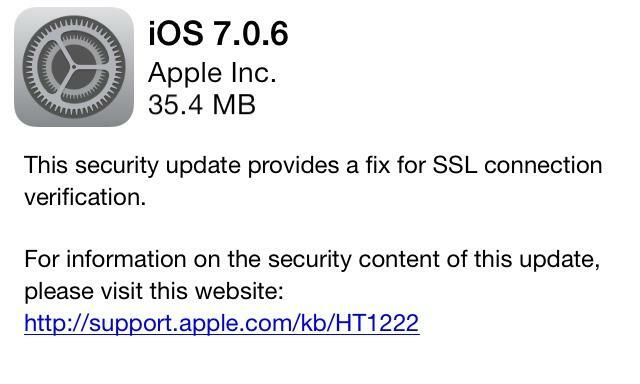 Apple on Friday issued a minor update for its mobile operating system, with iOS 7.0.6 fixing an issue with SSL connection verification. The new update is available by accessing the Software Update option in the native Settings application on a compatible iPhone, iPad or iPod touch. The security update can also be installed by connecting a device to a Mac or PC and downloading iOS 7.0.6 through iTunes. The sixth incremental update for iOS 7 arrives less than a month after Apple released iOS 7.0.5, intended to address some network issues associated with the iPhone 5s and iPhone 5c when being used in China. Still in beta testing is iOS 7.1, of which a fourth pre-release build was supplied to developers last week. The point-one release is more full-featured and is expected to contain numerous tweaks for the iOS 7 platform. AppleInsider reaffirmed earlier this week that iOS 7.1 is not expected to arrive until mid-March. The point-one release is also believed to include a major overhaul of Apple's Mobile Device Management mass deployment system, and will launch it alongside a totally new "Volume Services" Web client. Also released on Friday for legacy devices was iOS 6.1.6. It's available for the iPhone 3GS and fourth-generation iPod touch, which cannot run iOS 7. Update: Apple has subsequently released the corresponding Apple TV Software Update 6.0.2. Classified as a stability and performance update, the download includes general performance and stability improvements, says Apple. Users can update their Apple TV software via the device's Settings menu.